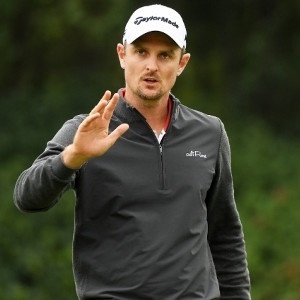 Augusta - Justin Rose was excited to reclaim golf's world No 1 ranking on Monday but the most meaningful comeback for him this week at the Masters is by caddie Mark Fulcher. Fulcher, Rose's regular caddie for more than a decade, will be back on the bag at Augusta National for the first time since undergoing heart surgery in mid-January. Britain's Rose, the 2013 US Open winner and twice a Masters runner-up in the past four years, says "Fooch" could be just the edge he needs to become only the fourth man to win the green jacket while atop the rankings. "He has been champing at the bit to get back," Rose said Monday. "Where Fooch is going to earn his money and earn his position on the bag and earn his importance on the team is on Saturday and Sunday. "Basically when emotions start to get more intense and there's more variability from that point of view, that's when I'm going to rely on him more and more." While Fulcher was off having his mitral valve repaired to allow blood flow between chambers of the heart, Rose was aided by Fulcher's pal Gareth Lord, who had caddied for Sweden's Henrik Stenson. Lord was bagman for Rose's win in January at Torrey Pines. Fulcher made an informal return two weeks ago at the WGC Match Play Championship, carrying bags for two practice rounds and walking with Rose during the competition, handling the comeback emotions before getting down to the business of winning a Masters. "When the going gets tough, that's when I think someone who knows you so well - and we have so many positive experiences out there under pressure that we can draw on together - that's where Fooch is going to come into his own for me," Rose said. Fulcher has stayed in close contact with Rose and Lord, who fulfilled the one task Fulcher requested. "Fooch said to Lordy, 'You've got one job, just give him back to me as world number one," Rose said. "The fact that the ranking switched this week was kind of a nice touch." It's not necessarily a good omen for Rose. The only Masters winners who were atop the rankings, which began in 1986, were Welshman Ian Woosnam in 1991, American Fred Couples in 1992 and US star Tiger Woods in 2001 and 2002. Rose, the 2016 Rio Olympic champion, says his margin atop the rankings is so slight that he won't take on the 17-year drought of number ones, dragging in past top-spot holders like Rory McIlroy, Dustin Johnson and Brooks Koepka. "No one is really being that dominant right now," Rose said. "I think if anyone's been dominant, it has been Rory in the last sort of couple of months. Hence, the ranking between Brooks, myself, Dustin, even going back to Justin Thomas, it has bounced around a lot. "From that point of view, I'm not going to take on that story." Rose finished second at the 2015 Masters behind Jordan Spieth, sharing the lowest non-winner total at Augusta National with Phil Mickelson, and lost a 2017 playoff to Spain's Sergio Garcia. "That was the first major I've been close to and not won, really like a heartbreaker. I took comfort in the fact that you can't get through a career without something like that happening, so just deal with it and move on," Rose said. "It just taught me when you win a tournament, you need that little bit of luck on your side." Stenson reminded Rose about some charmed moments the 38-year-old Englishman enjoyed in their gold medal battle at Rio. "Henrik pointing that out to me made it easier to accept and swallow, that I've had my moments where I've ridden my luck and this was one that maybe just kind of went against me," Rose said. "But you've got to keep putting yourself in those positions."